Describe the relationships of glycolysis, the citric acid cycle, and oxidative phosphorylation in terms of their inputs and outputs. In eukaryotic cells, the pyruvate molecules produced at the end of glycolysis are transported into mitochondria, which are sites of cellular respiration. If oxygen is available, aerobic respiration will go forward. In mitochondria, pyruvate will be transformed into a two-carbon acetyl group (by removing a molecule of carbon dioxide) that will be picked up by a carrier compound called coenzyme A (CoA), which is made from vitamin B5. The resulting compound is called acetyl CoA. (Figure 4.17). Acetyl CoA can be used in a variety of ways by the cell, but its major function is to deliver the acetyl group derived from pyruvate to the next pathway in glucose catabolism. Figure 4.17 Pyruvate is converted into acetyl-CoA before entering the citric acid cycle. Like the conversion of pyruvate to acetyl CoA, the citric acid cycle in eukaryotic cells takes place in the matrix of the mitochondria. Unlike glycolysis, the citric acid cycle is a closed loop: The last part of the pathway regenerates the compound used in the first step. The eight steps of the cycle are a series of chemical reactions that produces two carbon dioxide molecules, one ATP molecule (or an equivalent), and reduced forms (NADH and FADH2) of NAD+ and FAD+, important coenzymes in the cell. Part of this is considered an aerobic pathway (oxygen-requiring) because the NADH and FADH2 produced must transfer their electrons to the next pathway in the system, which will use oxygen. If oxygen is not present, this transfer does not occur. You have just read about two pathways in glucose catabolism—glycolysis and the citric acid cycle—that generate ATP. Most of the ATP generated during the aerobic catabolism of glucose, however, is not generated directly from these pathways. Rather, it derives from a process that begins with passing electrons through a series of chemical reactions to a final electron acceptor, oxygen. These reactions take place in specialized protein complexes located in the inner membrane of the mitochondria of eukaryotic organisms and on the inner part of the cell membrane of prokaryotic organisms. The energy of the electrons is harvested and used to generate a electrochemical gradient across the inner mitochondrial membrane. The potential energy of this gradient is used to generate ATP. The entirety of this process is called oxidative phosphorylation. The electron transport chain (Figure 4.19 a) is the last component of aerobic respiration and is the only part of metabolism that uses atmospheric oxygen. Oxygen continuously diffuses into plants for this purpose. In animals, oxygen enters the body through the respiratory system. Electron transport is a series of chemical reactions that resembles a bucket brigade in that electrons are passed rapidly from one component to the next, to the endpoint of the chain where oxygen is the final electron acceptor and water is produced. There are four complexes composed of proteins, labeled I through IV in Figure 4.19 c, and the aggregation of these four complexes, together with associated mobile, accessory electron carriers, is called the electron transport chain. 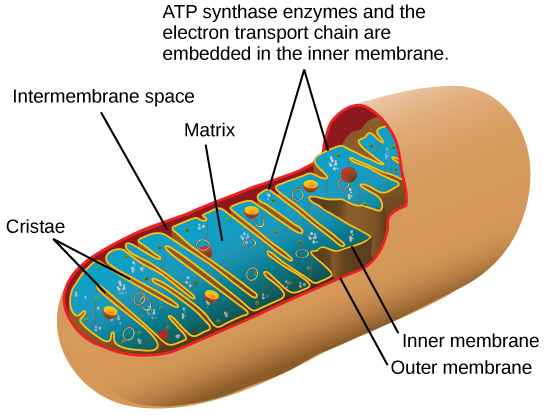 The electron transport chain is present in multiple copies in the inner mitochondrial membrane of eukaryotes and in the plasma membrane of prokaryotes. 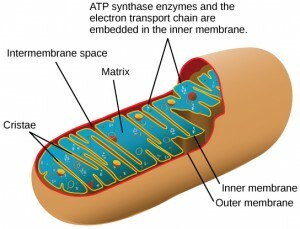 In each transfer of an electron through the electron transport chain, the electron loses energy, but with some transfers, the energy is stored as potential energy by using it to pump hydrogen ions across the inner mitochondrial membrane into the intermembrane space, creating an electrochemical gradient. Figure 4.19 (a) The electron transport chain is a set of molecules that supports a series of oxidation-reduction reactions. (b) ATP synthase is a complex, molecular machine that uses an H+ gradient to regenerate ATP from ADP. (c) Chemiosmosis relies on the potential energy provided by the H+ gradient across the membrane. Hydrogen ions diffuse through the inner membrane through an integral membrane protein called ATP synthase (Figure 4.19 b). This complex protein acts as a tiny generator, turned by the force of the hydrogen ions diffusing through it, down their electrochemical gradient from the intermembrane space, where there are many mutually repelling hydrogen ions to the matrix, where there are few. 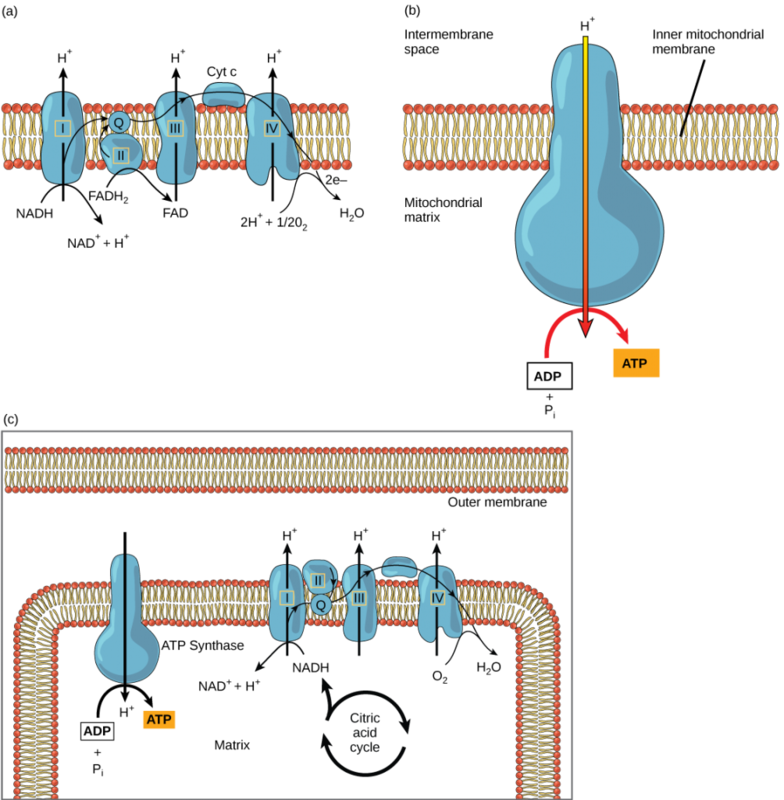 The turning of the parts of this molecular machine regenerate ATP from ADP. This flow of hydrogen ions across the membrane through ATP synthase is called chemiosmosis. Chemiosmosis (Figure 4.19 c) is used to generate 90 percent of the ATP made during aerobic glucose catabolism. The result of the reactions is the production of ATP from the energy of the electrons removed from hydrogen atoms. These atoms were originally part of a glucose molecule. At the end of the electron transport system, the electrons are used to reduce an oxygen molecule to oxygen ions. The extra electrons on the oxygen ions attract hydrogen ions (protons) from the surrounding medium, and water is formed. The electron transport chain and the production of ATP through chemiosmosis are collectively called oxidative phosphorylation. The number of ATP molecules generated from the catabolism of glucose varies. For example, the number of hydrogen ions that the electron transport chain complexes can pump through the membrane varies between species. Another source of variance stems from the shuttle of electrons across the mitochondrial membrane. The NADH generated from glycolysis cannot easily enter mitochondria. Thus, electrons are picked up on the inside of the mitochondria by either NAD+ or FAD+. Fewer ATP molecules are generated when FAD+ acts as a carrier. NAD+ is used as the electron transporter in the liver and FAD+ in the brain, so ATP yield depends on the tissue being considered. The citric acid cycle is a series of chemical reactions that removes high-energy electrons and uses them in the electron transport chain to generate ATP. One molecule of ATP (or an equivalent) is produced per each turn of the cycle. The electron transport chain is the portion of aerobic respiration that uses free oxygen as the final electron acceptor for electrons removed from the intermediate compounds in glucose catabolism. The electrons are passed through a series of chemical reactions, with a small amount of free energy used at three points to transport hydrogen ions across the membrane. This contributes to the gradient used in chemiosmosis. As the electrons are passed from NADH or FADH2 down the electron transport chain, they lose energy. The products of the electron transport chain are water and ATP. A number of intermediate compounds can be diverted into the anabolism of other biochemical molecules, such as nucleic acids, non-essential amino acids, sugars, and lipids. These same molecules, except nucleic acids, can serve as energy sources for the glucose pathway. What do the electrons added to NAD+ do? They become part of a fermentation pathway. They go to another pathway for ATP production. They energize the entry of the acetyl group into the citric acid cycle. They are converted into NADP. We inhale oxygen when we breathe and exhale carbon dioxide. What is the oxygen used for and where does the carbon dioxide come from? After cyanide poisoning, the electron transport chain can no longer pump electrons into the intermembrane space. The pH of the intermembrane space would increase, and ATP synthesis would stop. The oxygen we inhale is the final electron acceptor in the electron transport chain and allows aerobic respiration to proceed, which is the most efficient pathway for harvesting energy in the form of ATP from food molecules. The carbon dioxide we breathe out is formed during the citric acid cycle when the bonds in carbon compounds are broken. 4.3 Citric Acid Cycle and Oxidative Phosphorylation by Charles Molnar and Jane Gair is licensed under a Creative Commons Attribution 4.0 International License, except where otherwise noted.